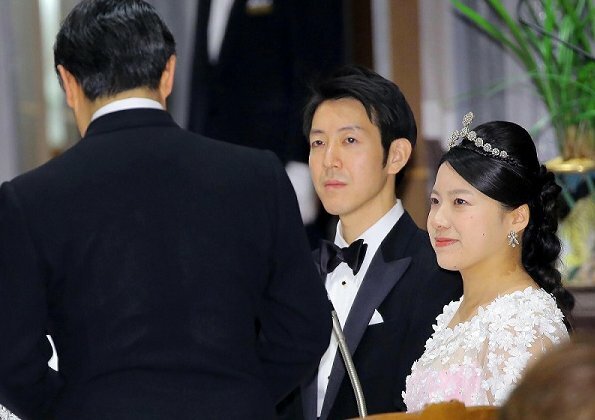 Nice to see the imperial family members gathering for this lovely couple wedding.Thank you for the pics.The bride style is typical Japanese . This is not the tiara from the parure that she received on her eighteenth birthday - I believe those jewels had to be returned to the imperial vault on her marriage, am I correct? This must be a new piece of jewelry. It's actually an old necklace from her mother's collection. 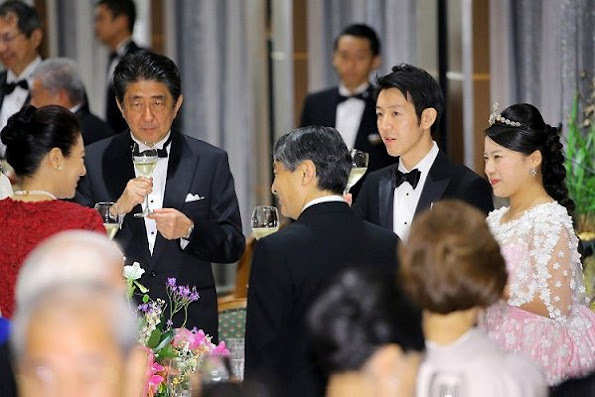 Crown princess Masako looks amazing in red,I would like to see more pictures !! 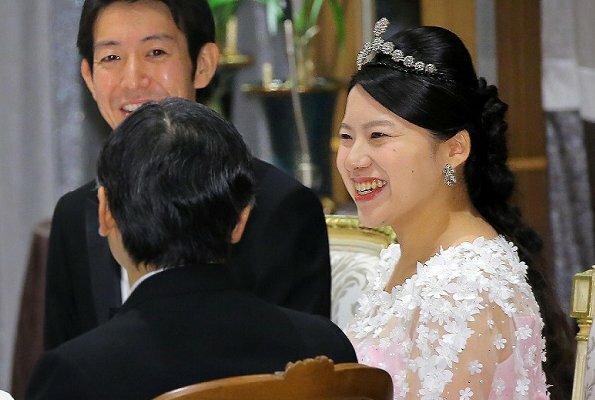 Not a fan of the bride's dress,and her tiara is strange. It isn't the prettiest tiara but I don't think the placement is helping with the overall look. May they have a long and happy life together! What a beautiful dress of the bride and a Tiara I never seen before. CP Masako looks stanning. 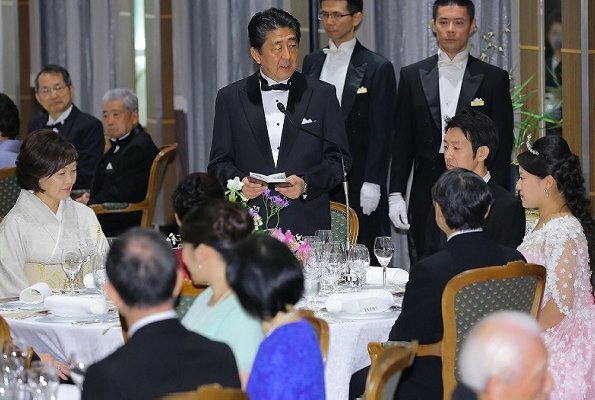 Well Mister Abe gives a speech how nice. Sadly she needed to give up her Title which she was born with. Doe's not seem fair. I Wish them all the Happiness in the World. Structurally and technically amazing dress with very pretty colour and elements but I don't like it - it's as if she's come dressed as the wedding cake. It's strange but it seems too old for her and as if it is wearing her rather than the other way round. I can't help feeling something simpler and in a bolder colour (like the traditional clothing she wore) would suit her better. 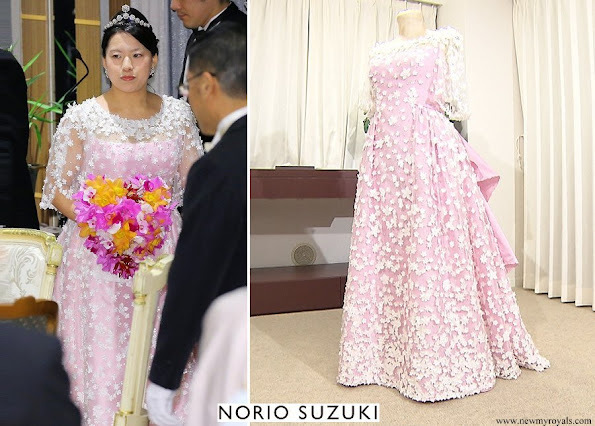 The pink silk is a gift from the bridegroom's mother before she has passed away to the bride (Princess Ayako)'s mother. The mothers have been acquaintances for years. Thus the dress is priceless. Thank you for the detail and a lovely day to include the bridegroom's late mother. However, my comment still stands - however technically brilliant I find the dress I don't think it suits the bride. It may not suit everyone's taste but the color & style are very typical Japanese style. Their modern version has a lot less variances of color & style. Simple colors & style are the norm. This may be because they also have their traditional dress where the fabric is so intricate & beautiful-they save the variety for that. I think she looks lovely with the color & style flattering on her. It is Eastern not Western fashion. I don't find the style simple at all and it doesn't look particularly "Eastern" to me - maybe it is in appealing to taste but in style it looks like a Victorian dress with a bustle. The important thing is that she enjoyed wearing it and she enjoyed all her wedding celebrations. It's nice to see these folks gathering to celebrate a happy occasion in style, looking relaxed and enjoying each other's company. 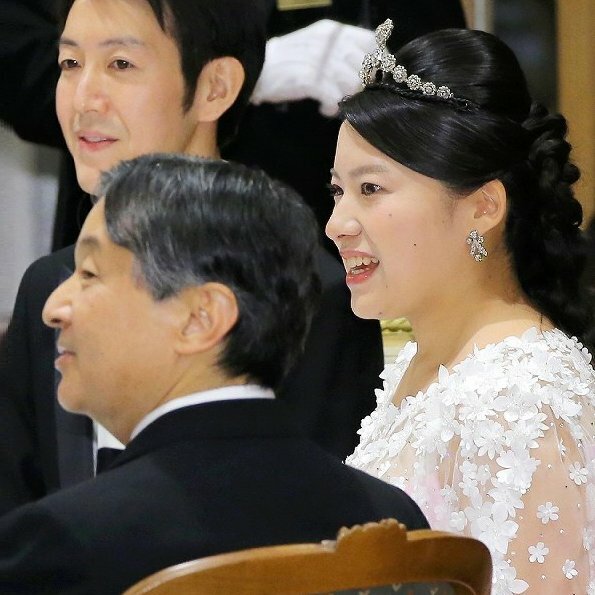 Crown Princess Masako always looks so youthful and glowing -- I would like to know her secret! Not a fan of that gown. I wish Icould see more of Masako’s dress, it looks awesome. Kind of bold for her but lovely. 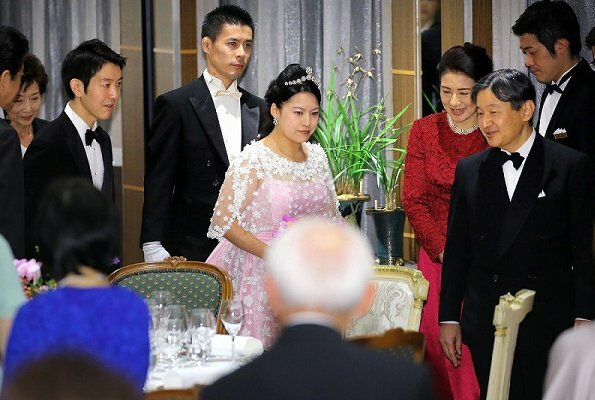 I hope now that her husband is going to be Emperor, she can begin to blossom and come out of her shell. I think she was stifled quite a bit. I am a Japanese. The pink silk is the gift from the bridegroom's mother before she has passed away to the bride's mother. The mothers have been acquaintance for years. Thus, the dress is priceless. They look so happy together, all the best for them! I think, the tiara is originally a necklace changed to a tiara for the occasion? Could be a wedding gift from the Emperor and as future commoner, she doesn't need a tiara. CP Masako looks beautiful and great in red …… it is not very often we see her dressed in colour. 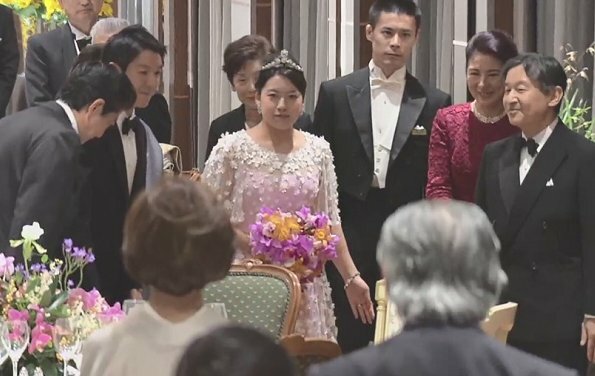 Don´t like very much about this look, Ayako somehow disappears into that dress and looks much bigger she is. Model of tiara does not help. Cannot be without thinkinh how beautiful she could have been just in simple pink silk dress without the out flower part. This couple is so cute and they look so happy. Best wishes to them! (Her dress isn't particularly flattering but I hope she loved wearing it and that's all that matters).